Oh merciful heaven, I am finally done with this book! What a relief! So many times as I was listening to this, I pondered giving up. It was so exasperatingly, unnecessarily slow. The print version is well over 500 pages, and it took me over a month to get through the audio, listening at all my usual times. (The typical audiobook takes me about two weeks.) The length on its own need not be a problem at all—I love a good, long book—but the pacing of The Distant Hours is a mess. Glacial at times, and then spilling masses of information all at once. So why did I persevere? Well, it was because the story was so good. I had to know what happened! Jenny recently referred to Kate Morton as “the author of my list,” meaning that her books have all the right ingredients, but they just don’t quite deliver. That seems just right to me. In The Distant Hours, there’s a mysterious letter from the past, flashbacks to World War II, an evacuated child living in a castle, twins, family secrets, a presumably jilted woman wandering around in her wedding dress, and a mysterious man of mud. Oh, and there are found journals, old manuscripts, and a literary mystery. So much awesome! The problem here is mostly that Morton takes something in the neighborhood of a bajillion words to say things that only require ten words. Now y’all know I’m a fan of lush and leisurely prose, but I wouldn’t call the prose in The Distant Hours particularly lush. It’s mostly the slightly poetic, mostly workmanlike prose I find in a lot of popular fiction. There are some nice turns of phrase and a few clunky metaphors, but nothing out of the ordinary. It’s just that there’s so much of it. Morton repeats information and explains obvious motivations and generally fails to advance the plot at a pleasing clip. If the story weren’t good, I could easily just dismiss this as a “meh, not for me” book, but I found myself really frustrated at how the good story was getting lost in all the lackluster dressing. I do think I would have been less annoyed if I’d read this in print instead of listening because I could then have skimmed through the boring bits. In fact, I tried to get the print copy from the library so I could skim to the end and see what happened, but it didn’t arrive in time. So I was stuck with audio and had to listen to every. single. word. And now I’m done. Finally. Whew, finally! Seems like we talked about this on twitter a long time ago! The Forgotten Garden audio was good, but long. I haven’t recommended it to anyone though. Think I’ll skip this one and try the print version of The House at Riverton instead. It did take ages! I’m not keen to try anything else of hers, but if I do, it’ll definitely be in print. I liked this book, actually more than liked it, but I didn’t love it for all the same reasons you state. It felt at times the story just stopped and I wanted to put it down but couldn’t because I really did want to know what happened. I just wish it would have happened at a much faster rate. At one point I did read ahead to see what was going to happen and that did help me get through the slow parts. I’m not sure I would have made it through listening though. At half the length I think this would have been great fun. I really did enjoy the story, and I probably would have found it less frustrating if I’d been able to skim. I read Morton’s debut and that it was waaay too derivative and poorly written. And every post I’ve read about her subsequent books have convinced me she’s not my style author. Which is a shame, because like Jenny, in theory I should be all over her novels! Oh well. I can get what you’re saying about her writing being derivative, but for me that aspect of it could make for fun comfort reading. But the writing and extremely poor pacing will almost certainly keep me from reading her again. Oh dear. Amazon has lately been on a kick of recommending Morton’s books to me and while I initially dismissed them without any investigation, when I did look into them, they sounded really cool! So I added one to my wish list… but now you have me thinking that that was a mistake. I didn’t realize her books were so needlessly long-winded, but that would really bother me since I often feel like books over 350 pages can use some editing. I love Jenny’s “the author of my list” construction. I think about it frequently when some situation or piece of art seems like it should be awesome but somehow doesn’t quite measure up. And I agree that needlessly long-winded audiobooks are particularly frustrating. I remember wanting to bang my head against the wall during Henry James’s What Maisie Knew – and it’s only a novella! It was incredibly frustrating, and not having a sense of how much was left only made it worse. A slow-paced, long book with beautiful language is a whole different thing from this. A.S. Byatt’s The Children Book is a great example of how that can work beautifully, but Kate Morton is no A.S. Byatt. I decided Morton was not for me after I read her first book, THE HOUSE AT RIVERTON, which (as Eva notes above) read in large part so much like a pastiche of “Upstairs, Downstairs” that I started referring to characters in the book by the names of their counterparts on the television show (footman, butler, parlormaid, etc.). In fact, I was stumped at one point by reference to a character named “Albert” until I realized that I had been thinking of him as “Edward” in my head because he was a footman. I also found the book’s “shocking revelations” less than shocking because they had been forecast so clumsily for pages (and pages and pages) beforehand. Morton would probably benefit from some experienced editing–but does such a function exist in major publishing houses anymore? Anyway, harsh as it may sound, life’s too short and there are too many books by authors that I WANT to read for me to keep going back to a disappointing writer. I did pick up on some of the revelations really easily, but there were still enough surprises for me not to be annoyed by that. I do think with some stronger editing her books could be really good. (I always hesitate to criticize the editing because I never know what the book looked like before an editor got it and how many suggestions the author rejected.) And I totally agree about not going back to a disappointing writer. I might give an author a second chance, but not usually more than that. I certainly agree with you and Jenny about Morton, although I think my expectations were higher, so I felt more disappointed. Also, as Deb observes, the foreshadowing is heavy-handed and annoying as all get-out. Having seen Jenny’s post, my expectations were not so high, but I was still surprised at how frustrated I got. Skimming would have made a huge difference in my enjoyment, but it think it says something pretty awful about a book if it’s only enjoyable when you skim, LOL. I thought the beginning of the book was better than the second half (felt the same way about Secret Garden). I don’t think I could have listened to it at all. Yeah, the beginning got me sufficiently hooked, but it didn’t maintain steam at all. By the time I was really frustrated, I was just interested enough in the resolution to see it through to the end. What a bummer! I hate to hear this! I loved The House at Riverton and was looking forward to this one. Have you read any John Harwood? 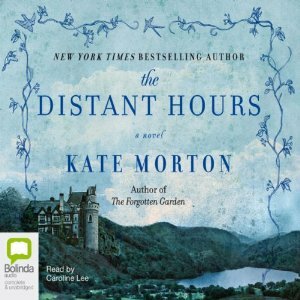 The Distant Mirror sounds like a watered-down version of one of his books. I haven’t read any Harwood, but I’ve heard good things about The Seance and The Ghost Writer–just haven’t looked into them. If I’m going to read a ‘Distant’ book, it will be ‘A Distant Mirror’ by Barbara Tuchman which is a European history of the 14th century.